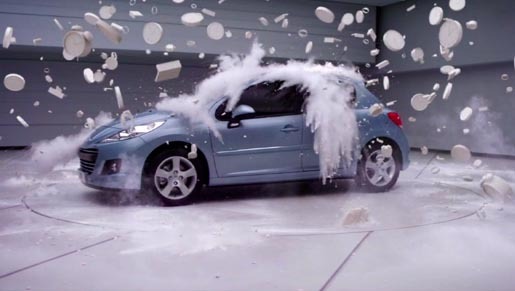 Peugeot is marking the release of its new model 207 with “Rain”, a film using 3D technology to illustrate the concept of being “time proof”, designed to withstand the effects of time on fashion. A silver Peugeot is bombarded with white time pieces, digital and analog. The film was produced using 3D technology, all with the arty touch of the Zeitguised animation studio. Cinemas in the UK, France and Ukraine are showing the 3D/stereoscopic version. Automobiles Peugeot marketing staff on the project were Olivier Gandolfo, Nathalie Le Maitre and Derota Kozlowska. The Rain ad was developed atBETC Paris Paris and Milan by executive directors Henri Tripard, Jean-Baptiste Lucas, Vittorio Lucchini Gilera and Thomas Boutte, global creative director Anne Cécile Tauleigne, creative director Francesca Deluca, art director Luca Ghilino, copywriter Vincenzo Garzillo, strategic planner Clariss Lacarrau, legal negotiator Sophie Sanchez, agency producer Solène Franck. Filming was shot by director Zeitguised (Jamie Raap and Henrik Mauler) via Stink, Paris and Berlin, with director of photography Thomas Stokowski, executive producer Greg Panteix, editor Emmanuel Turlet, set designer Sven Gessner. Post production was done at Nightshift, Paris, by post producer Denis Brunier. Music, “Blue Steel”, performed by Bot’ox, was composed by Benjamin Boguet (Cliché), Julien Briffaz (La Truite) and Anna Jean (Rockumentary), mixed at I’m A Cliché Records. Sound was produced at BETC Music/Gum by Fabrice Brovelli and Christophe Caurret.